Jean Moss, knitwear extraordinaire has recently published her latest book, Sweet Shawlettes, and lucky me I got a sneak peak! This new book has 25 designs and I’m pretty sure you’ve never seen anything like it. The textures, techniques, and styles are incredibly varied so there is something for everyone. Friday January 27th we will be giving away a copy of Jean’s book at knit night via a draw at 9pm. Put your name in the draw starting at 6. Jean was good enough to answer a few of my questions about her new book and her design inspirations. 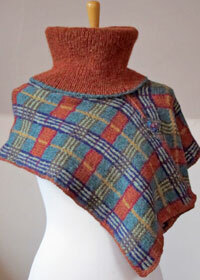 Jean, your shawl designs are so delightfully varied, where do you draw your inspiration from? My career has always been fashion-led, so each season I look at the trends. I also love street fashion and like nothing better than to sit in the sun with a cup of coffee and observe what people are wearing – especially in the big cities. I’m also fascinated by old fashion illustrations, the designs of David Downton, Rene Gruau and Erte are mega-inspiring. My camera is always to hand and I take many pictures of interesting objects, people and places – looking back over themoften sows the seeds of new designs. 2. 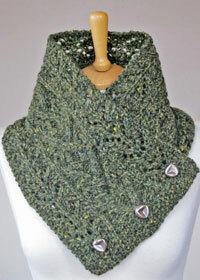 You have so many different shawlette constructions, do your designs influence the construction or the other way around? Previously most of my books have concentrated mainly on sweaters, and Sweet Shawlettes gave me the opportunity to explore a totally different form. Shawls, capes, cowls, furbelows or anything that can be worn around the neck was the brief and I was thrilled to find as many ways of interpreting it as I could. I usually sketch a design and then I look at the possibilities for construction, yarn, stitch and techniques. Being an incorrigible technique freak, I love to pass on as many as I can through my designs and shawlettes seemed like the perfect medium for offering tasters, without the commitment of a larger piece, either in time or yarn. 3. With so many fibers and colours to choose from, how do you make your yarn selections? I’m very keen on sustainable and ethical fibres and would have liked ideally to include more than eventually made it into the book. However, the timeframe of the book was so tight, I knew I had to use yarns I’m familiar with and trust, so in the end the majority of the projects used many different Rowan yarns, including their gorgeous eco-yarns. Trying out new yarns is one of the bonuses of writing a book and it was like Christmas opening the box when it arrived from Rowan – twenty-four different qualities, each one as fabulous as the next. I’ve been using their yarns for many years now, so I can make confident choices, knowing that they won’t be far off the mark. 4. From 25 patterns, do you have a favourite? I find it hard to design knits I wouldn’t wear myself, so it’s fair to say I’ve loved each project in turn as I’ve designed it. 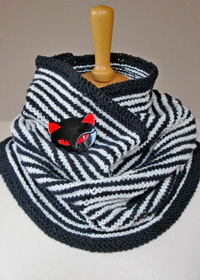 However, the project I chose to knit for friends this Xmas was Drift from the Couture chapter. I love big cables and this easy cowl has the bonus that it’s quick to knit and fabulously wearable – I’ve rarely had such positive feedback from everyone who received it! 5. What exciting projects do you have on the horizon? I can’t wait to see what’s next! This year we have two upcoming knitters’ tours – Lakes & York in May and Knit Ireland in September. We put a lot of work into making sure everything goes like clockwork, so we’ll be frantically dotting the i’s and crossing the t’s over the next couple of months. Knit Ireland is full, but there are still a few places on Lakes & York so if you or any of your readers fancy eleven days of total knit immersion with kindred spirits, get in touch or visit the website for a taster. Knitwise I always have things on the go. I’m in negotiation with Taunton for a new book. Can’t say a whole lot about it other than it’s developing one aspect of Sweet Shawlettes and applying it to other small projects. I’d also like to play more music, perhaps get a band together performing, amongst other things, eine kleine knit music. This entry was posted on Friday, January 20th, 2012 at 9:20 pm	and is filed under Uncategorized. You can follow any responses to this entry through the RSS 2.0 feed. Both comments and pings are currently closed.